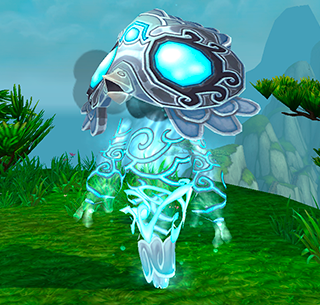 Whispering Pandarian Spirit is located in the Jade Forest at 28,36. Her 2 team members are Whispertail and Dusty. 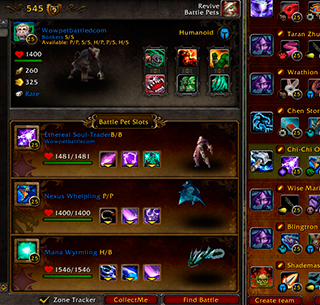 So for this encounter, you can Level a pet or just zerg it. My team is : Onyxian whelpling, Flayer Youngling, and a Scourged Whelpling. Dusty is a critter, even though its a moth and should be a flyer. Whatever. Start with your Onyxian whelpling. She will hit you with moth dust, and try to sleep you. IF it connects, just pass the round and attack when you can. when she cocoon strikes, mothballs are always next, and they stop her speed by 100% for around, so use that time to lift off. from here its just healing flame and whip spam. Whispertail is a dragon, and gives us achance ot use my FAVORITE dragonkin killer, Flayer Youngling. Switch to him, as long as he's S/S you wont pay the penalty for pet switching ( which is usualy going after them, instead of before See our pvp team guide for details.) Start with kick, its 100% chance to stun, follow it up with blitz, your gona hit no less then 2 times, almost always a third. Hold deflection until theres 1 round left on kick, and keep the dragon stun locked. its a quick win. Whispering Pandarian Air Spirit is pretty simple. She tries toout heal our damage, but we got the medicine for that. Enter the Scourged whelpling. Start off with your Darkness to negate the healing she puts out, drop the pet version of DND wich is called plauged blood, and spam tail whip. re up darkness if you can and shes dead. even if she kills you the scourged whelpling is undead, so it gives you a free round to do whatever you need to, reup darkness, reup plauge blood, whatever. Watch the video below for a one shot!